At the end of the trail is of course Moscow, which I got ample opportunity to compare with St Petersburg a few days later. The capital curiously reminded me of London. Suffice it to add a few remarks about the capital: It is impossible to fail to notice a dress sense that would raise eyebrows even in the blasé west. 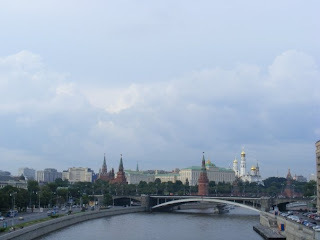 In Moscow, the miniskirts are the shortest of them all and the high heels the most gargantuan. It may seem impractical; hobbling across cobbled stone streets, but is very much in keeping with the city of extremes. Behind the red wall of the Kremlin, rises a forest of onion domes, vying for attention with oddly tent-shaped turrets and towers. It is easily one of the most headily exotic skylines in Europe. 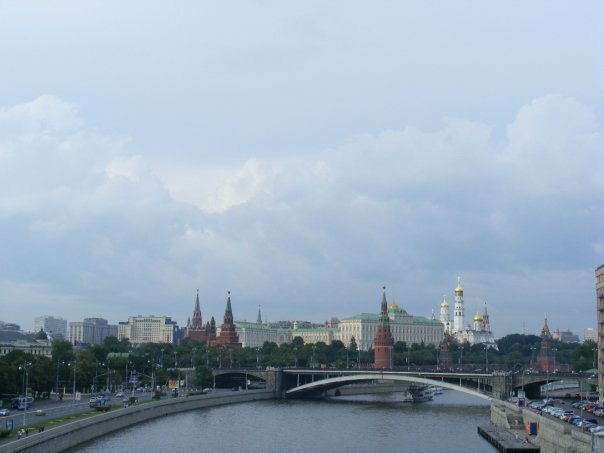 In order to enter this bastion of tsarist rule, however, you need to circle the ramparts in order to reach Spasskaya tower, where you better not fumble with the change, or you’ll receive a torrent of abuse from the woman selling the tickets. Expect the same treatment from pretty much everyone from bars to restaurants. Get used to it, they don't do polite in Moscow. Yet, the capital is surprisingly upbeat and forward looking. St. Petersburg, on the other hand, is a museum. Even in the summer heat, there is a frosty and impersonal character to the place. And yet, the city is still mesmerizingly grandiose and beautiful. Arriving from an overnight train from Moscow, during which we had the privilege of sharing a cabin with a fussy grandmother and a pampered grandson, our first encounter in the imperial city is with eager taxi drivers. We are inevitably taken for a ride, quite metaphorically, as Russian taxis don’t run on meters, and since we had no idea how close the hotel actually was to the train station. Not quite convinced, we are presented with a list of figures on a printed scrap of paper, demonstrating, supposedly, that the outrageously high price is the official tourist fee. The city that Peter the great originally intended was modelled on Amsterdam. Indeed, some of the oldest buildings in town suggest an air of northern simplicity, and, of course, there are the canals. 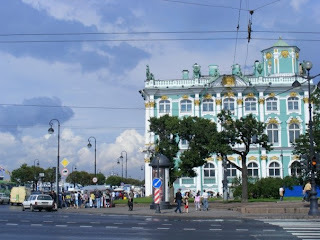 However, St Petersburg is not an Amsterdam of the east, though that would be less of a misnomer than Venice of the north. Many of the architects that contributed to the building of the city were Italians or of Italian origin, but the palatial facades of the imperial capital are not quite like anything found south of the Alps. A possible exception are the rusticated gateways within the Peter and Paul fortress complex, hidden gems that would feel at home just as well in Verona as the shores of the gulf of Finland. Much of the rest of the city, however, is a colourful, yet solidly classical baroque, and the later neo-classical, empire, historicist and art nouveau additions do not detract from this general impression. The winter palace is a prim creation in brick and plaster, using contrast of colour and the piling on of decorative elements as primary means to attract attention. The overall effect, however, is not entirely convincing and the building struggles to stand out along a highly palatial waterfront. Moreover, The rococo-esque expression of the building betrays a vague sense of sham, given the modest brick material at its core. Across the palace square flows a gigantic sweep of a building, in a marked contrast with the winter palace. Its architectural expression is bare in comparison with its florid neighbour, though its focus of attention is more crystallised and immediate. The triumphal arch, which plays the role of frontispiece caps the overall effect of imperial might. The square itself is, thus, left with a sort of yin-yang effect of masculine and feminine qualities at either end. Horse and carriage trot across looking for the next pair of tourists, with a carriage man in a suitably ludicrous 18th century dress. Seen from the Neva river, there is a sense that the city lacks horizontality, and this is only slightly made up for by the St Isaac’s cathedral, a not particularly original but successful addition to the classical portico and dome theme. However, it is interesting to note that the contrast of the most self-consciously Russian building in town, the Church of Our Saviour on Spilled Blood, ultimately creates the most picturesque backdrop along the canals. It is interesting in a city that was created explicitly as a window to the west, or a rather a city in imitation of the west. Essentially, St Petersburg is a tourist town, in ways that Moscow is not. There is a sense of a retreat, of an escape into the romantic and pure that infuses it with life. In that respect, the two major cities of Russia could not be more different.